Shahid Kapoor and Misha Kapoor who are expecting their second baby made a cute yet stylish entry at Akash Ambani- Shloka Mehta's engagement ceremony last night. As always, they were at their adorable best and even indulged in some cute PDA's (public display of affection) while their photo-op session. 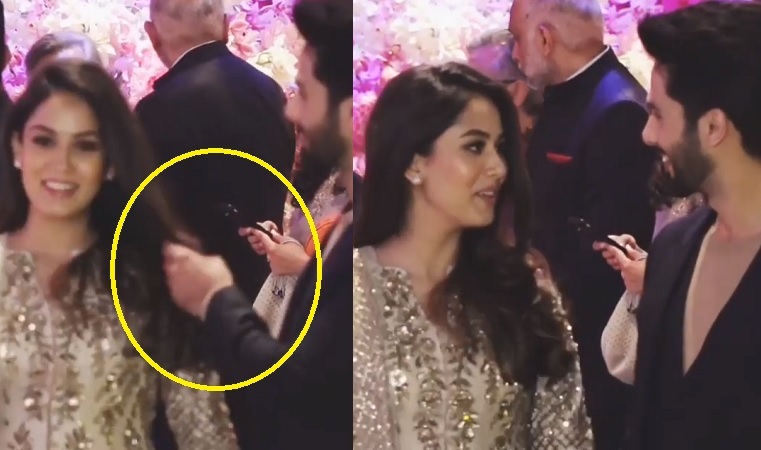 Shahid and Mira were posing for the papz and in between, Shahid turned to Mira and loving caressed her checked on her hair and straightened them and said something to her. On the work front, Shahid is shooting for his next film "Batti Gul Meter Chalu".